All zip codes finalized and as promised, "Nearby Search" is now available both on the desktop/mobile and The App. Much Easier to find locations and listings close to where you are. Featured Rooms section is also added to The App. GoDeal$ section for pool rooms, bars, taverns and sports bars also for vendors, partners and advertisers. Thanks everyone for the support as always and don't forget to rate the app, if you get a chance. It has been 5 years since we first introduced GoPlayPool to the world. Since then, we've done a lot to improve what we offer! If you haven't had a chance to look at our new system, please do. You can search for locations, find out about table sizes and brands, tournament/league availability, age limitations, amenities, food and alcohol info, entertainment, details about other games and much more! The search engine helps you filter through locations depending on what you're looking for. Yes, there will be missing information and incomplete profiles and we are hoping with the help of the public, the business owners and management, we can keep the platform updated and current. We're constantly working to ensure it's as updated as possible. Very minimal advertising, no pop ups and no "forced" logins allows users to cruise through the system as they please. They also include our high traffic "flyers" section and "GoPlayPool 101"! GoPlayPool platforms are 100% free to use! We truly appreciate your input, your edits/adds and keeping the platform updated! Now let's Search, Find and Go Play Pool! 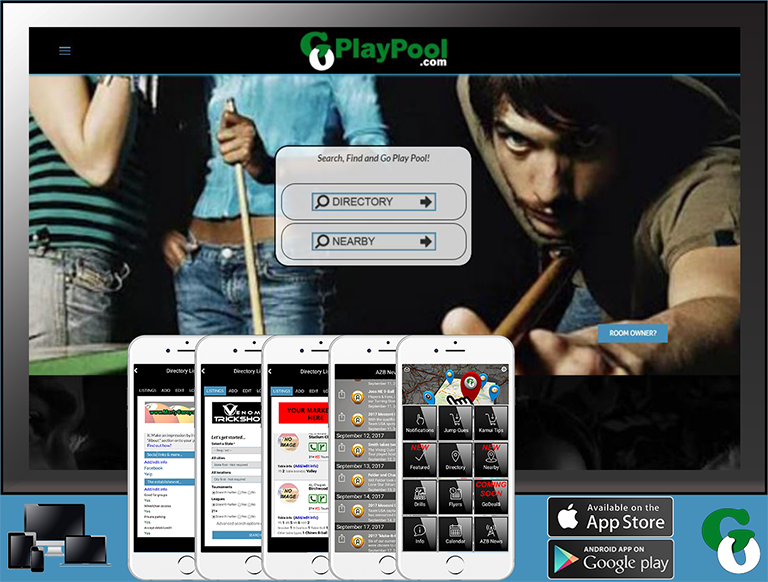 You can view US Pool Rooms Directory on the GoPlayPool Platform, available for Web, Mobile, App, Windows and Black Berry! Friendly to all platforms. While updates are done on a regular basis, it is impossible to keep up with the daily changes that happen all across the country. New locations open, establishments go through ownership changes, and rooms close down on a daily basis. If you know of a pool hall/bar listed on the GoPlayPool platform that is no longer open, or if you know of a room that is not listed on the directory, please let the people at GoPlayPool.com know. The GoPlayPool App Team is working hard to provide this directory. 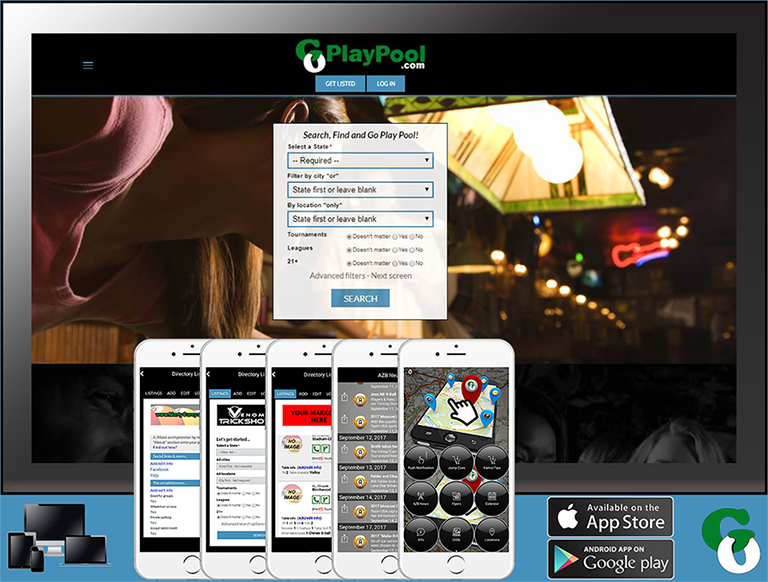 Pool halls and bars can promote their tournaments, leagues and events when they become a GoPlayPool App Member. We thank you for helping us improve this directory. And, we also thank AZ Billiards for helping us with this ongoing process! I just want to put in a good word about the directory database maintainers of this site. I suggested a few changes for the states of CT and NY just yesterday, and those changes have already been implemented. Great work, admins! Just a suggestion; when you fill-out the form to suggest changes, include as much information as you can -- including the URL (website link) of the poolroom itself -- so that the admins can check to make sure no typos were on the form. Is the only info available about each room the telephone number? I suggest that if I click on a room I ought to be able to enter corrections or additional info directly for that room. (Obviously, you may want to filter that info before making it visible.) Right now that doesn't seem to be possible. If you want feedback/corrections, it needs to be as easy as possible for users to give it. The reason we have rooms which have one or two pool tables is because of the concept behind it. Our guideline is simple: "An establishment with one or more pool table(s)". The more we have on the list, the more we can continue supporting the sport! And as more information is made available to the users, the more they will want to "Go Play Pool"
We are at this 15 hours a day! So, we will try to keep up with the edits and input as much as we can! Thank you again for helping us improve the directory. We are just entering "stage 4" of this app! Lots more behind the scene which requires approvals from "Apple" and "Android" before the information can be presented to the public. -Rating systems for "thumbs up and down"
Compiling this data is a huge task and room owners / players input and help is always appreciated. We have just entered this stage and have final approvals to proceed. The number of tables and sizes would be nice to be able to distinguish an actual pool hall from a bar with a couple of tables. Keep up the good work!!!!!! The Only App that Matters! I love the GoPlayPool App! I travel around a lot, due to my work, and i am always able to find the best place to play, practice or compete. Plus the folks at GoPlayPool are the greatest, doing much for charity events and helping struggling pool halls stay in business. I can't say enough about what an awesome service GoPlayPool provides to the Billiards community, and helping to community together! This is the best thing that's happened to pool -- well, at least pool in the States -- since the break cue. Well done! The Best Thing to happen to Pool Since POV Pool! We just want to wish all of our pool family, friends and fans the best of wishes in this Holiday season! We have some brand new concepts and upgraded platform in the works for 2016! Merry Christmas, Happy New Year and be safe! Download the FREE GoPlayPool App! Location: North Hollywood/ San Fernando, Ca. Me too! I love the GOPLAYPOOL App. (BTW Highland Park Billiards was purchased and has been closed for a couple months, I have no Idea what will be done with the property) Keep up the great work and Merry Christmas and a very Happy New Years to everyone at "Go Play Pool" The only App I actually need! Soon you will be able to post and edit events and flyers. Edit room information, add images and descriptions. The database is almost done!